Oosterbaan Fieldhouse is the home playing field of the Lacrosse team. It is located adjacent to Schembechler Hall on State Street. The building is also used by the football, baseball, softball, and field hockey teams for indoor practices as well as the University's intramural and club sports. Featuring a complete artificial turf field without a raised crown, the enclosed practice and playing area provides year-round training and development opportunities. Oosterbaan Fieldhouse, constructed in 1970, features two endline filming stations, a climate-controlled playing/spectating environment and sideline seating for 500 people. The building is joined to Schembechler Hall which houses state-of-the-art athletic training and weight rooms. 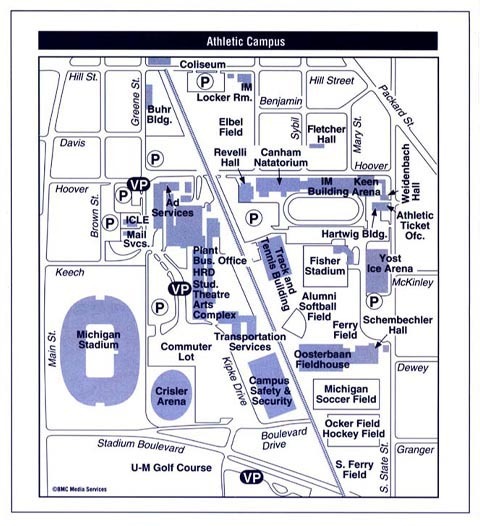 Oosterbaan Fieldhouse is located on South State Street adjacent to Schembechler Hall. The facility is directly accessible from I-94 at the State Street exit #177, and can also be reached off the Ann Arbor-Saline exit #175, or Jackson Road exit #172.